Les fonds documentaires sur l’Égypte, de l’Antiquité à l’époque contemporaine, sont d’une très grande richesse. Des centaines de milliers de pièces sont conservées dans les collections publiques et privées : objets archéologiques, manuscrits, photographies, récits de voyages, cartes géographiques, dessins, estampes, tissus, journaux intimes ou de campagnes, mémoires et correspondances, archives diplomatiques et commerciales, etc. Plusieurs établissements de la Région Provence-Alpes-Côte d’Azur possèdent de remarquables ensembles de documents sur l’Égypte, E-CORPUS en présente déjà quelques uns, d’autres viendront compléter virtuellement cette vaste source d’informations, en une bibliothèque « sans murs », qu’alimentent également les fonds égyptiens de plusieurs établissements en France et à l’étranger. e-corpus is a collective digital library that catalogs and disseminates numerous documents: manuscripts, archives, books, journals, prints, audio recordings, video, etc. We are very pleased to announce that the OLH is now open for submissions to its new megajournal, which covers the humanities disciplines. The submission platform, developed by Ubiquity Press, is based upon PKP's excellent Open Journal Systems, but has been extensively modified to accommodate the editorial flow that is needed in a highly-distributed, large-scale system. We intend to release the source code for these modifications under an open license in the near future. We are also pleased to say that negotiations on the set of initial journals that will share an economy of scale and our economic model are well underway. More announcements on this front will be forthcoming in the near future. In the meantime, we would ask those who pledged articles to now begin to submit your work! We are aiming for a launch next year between May and Summer 2015. Thank you for your ongoing support in the creation of an open research and dissemination ecosystem for the humanities! Thomas Dwight Goodell, A School Grammar of Attic Greek (New York: D. Appleton and Co., 1902). The work was scanned by the Internet Archive. This version was created in 2013­–2014 with support from the Roberts Fund for Classical Studies and the Mellon Fund for Digital Humanities at Dickinson College. Bruce Robertson of Mont Allison University performed the OCR using Rigaudon, the output of which is available on Lace. At Dickinson the OCR output was edited and the XML and HTML pages created by Christina Errico. Ryan Burke created the web interface, and Meagan Ayer edited and corrected the HTML pages. The content is freely available for re-use under a Creative Commons Attribution-ShareAlike license. 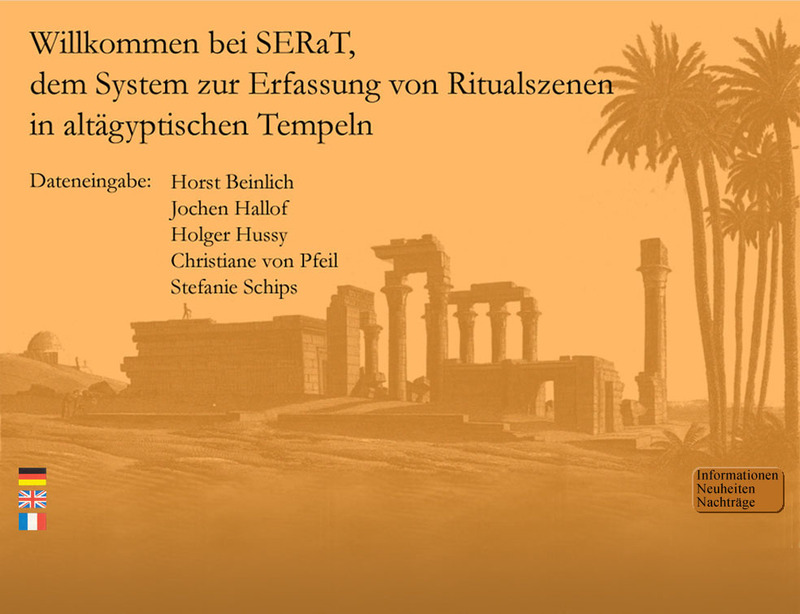 The Center for Hellenic Studies is pleased to announce the online publication of Poetry as Initiation: The Center for Hellenic Studies Symposium on the Derveni Papyrus by Ioanna Papadopoulou and Leonard Muellner. KALAKORIKOS es el fruto de una larga carrera de concienciación y de lucha en favor del patrimonio histórico-artístico calagurritano por parte de la Asociación Amigos de la Historia de Calahorra. Sus objetivos principales son difundir la historia de Calahorra y su comarca, promover estudios e investigaciones, actuar en defensa del patrimonio arqueológico, histórico, artístico y cultural de esta ciudad. La revista admite colaboraciones de investigadores que centren su ámbito de trabajo en cualquier aspecto vinculado con Calahorra y su comarca. 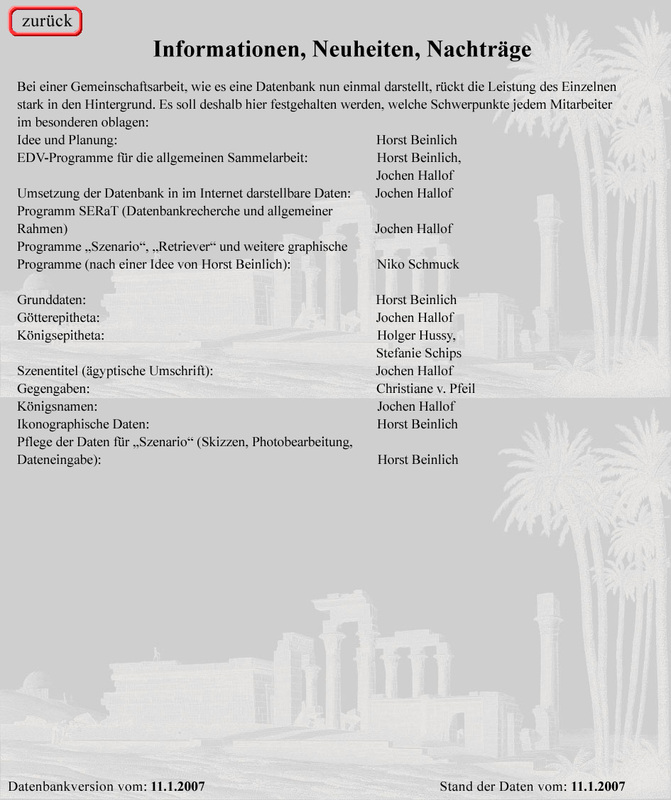 The BIBLE+ORIENT Museum Database is a web based database created for the electronic management of ancient Near Eastern image and object data. The numerous data fields enable not only a precise cataloging of the museum inventory but also systematic searches for purposes of scientific research. Furthermore, the database admits the consultation of digitalized catalogs of the collections, the management of image series (e.g. slide shows), the making available of dynamic e-Learning content and the fast creation of PowerPoint presentations as well as publications. The user has at his disposal images in an unlimited amount of views for each object, each in the following four formats: thumbnail, normal size, PowerPoint format and print resolution. The idea of an internet database allows not only world wide access but also stimulates the cooperation between partners who want to share the data with one another. The database was designed so that image and object data from an unlimited number of institutions and private persons can be managed. Currently, we are working on national, European and global levels to include into our database objects from other iconographically relevant collections as well. William Flinders Petrie excavated at Hawara in 1888. After working in Medinet el-Fayum (Arsinoe) and Biahmu, he moved on to the site south of Arsinoe and took the 60 workers he had already employed at the former sites with him. The results of his excavations at Hawara were published in 1889 in his "Hawara, Biahmu, and Arsinoe". The papyrological material said to have been found at Hawara was studied by Prof. Sayce and published on pages 24 to 37 of that volume. Sayce gave a general description of the great papyrus roll which contains parts of books 1 and 2 of the Iliad (the "Hawara Homer"), emphasizing the importance of the variants, and edited the texts of the most complete documents, some of them in a very preliminary way. J. G. Milne undertook a new edition of 37 of these papyri in the Archiv für Papyrusforschung 5, 1913, 378-397. He did not work on the Hawara Homer but concentrated on the smaller literary texts and gave a proper publication of some more documents. The texts which were not reconsidered in Milne's publication were reprinted in Sammelbuch I (nos. 5220, 5223, 5224). When Flinders Petrie brought his finds back to England, the material was divided between several institutions. The Hawara Homer was given to the Bodleian Library in Oxford (where it still is today), while all the other papyrological material stayed in London and was given to the Department of Egyptology at University College London. In 1948, the young professor of Papyrology, Eric Turner received permission from the then Professor of Egyptology, J. Czerny, to take the Hawara papyri to the Department of Greek and Latin at UCL and to keep them there in his custody. A letter from 16 June 1949 confirms the transfer of the papyri. They were kept in a secret place in the department for more than 50 years. As usual, Flinders Petrie did not give precise indications, as to where the papyri were found on the site. He just mentions that the region north of the pyramid "was the usual place for burials in the early Roman period , when gilt cartonnage busts were used. 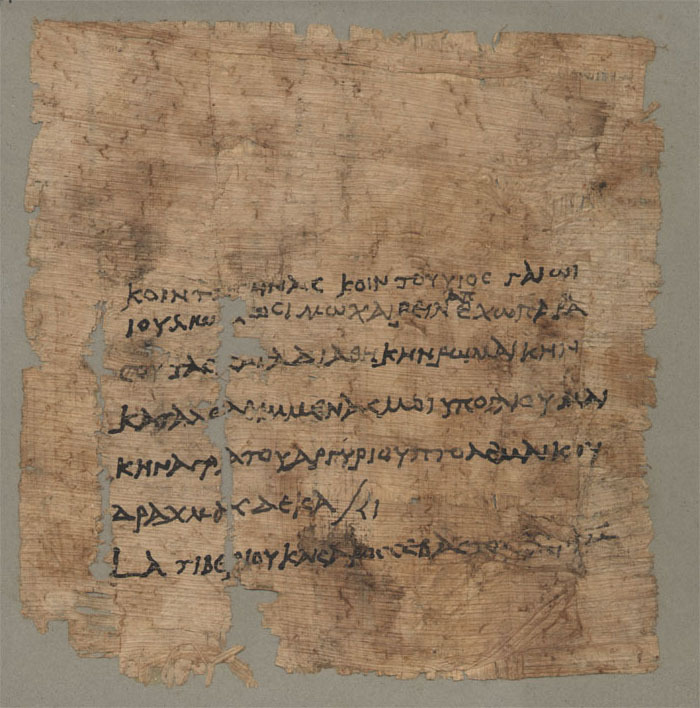 Papyri from the Ist and IInd cent. AD are also usual in the soil here, and for some way north" (p. 8, no. 11; cf. the map on plate XXV in the book). When the papyri arrived in London they were "ironed" by Petrie's friend, Mr. Spurrell who also helped in "unpacking, arranging, and managing the collections" (p. 4). It must have happened then that all the pieces were glued onto greyish cardboard. When writing was distiguishable on the back of the papyri, windows were cut out to make the letters (at least in part) visible. In some instances, Petrie added small notes in pencil about find-spots. In later years, Walter Cockle removed some of the papyri from their cardboards and put them under glass. The cardboard frames of these pieces were nevertheless kept. 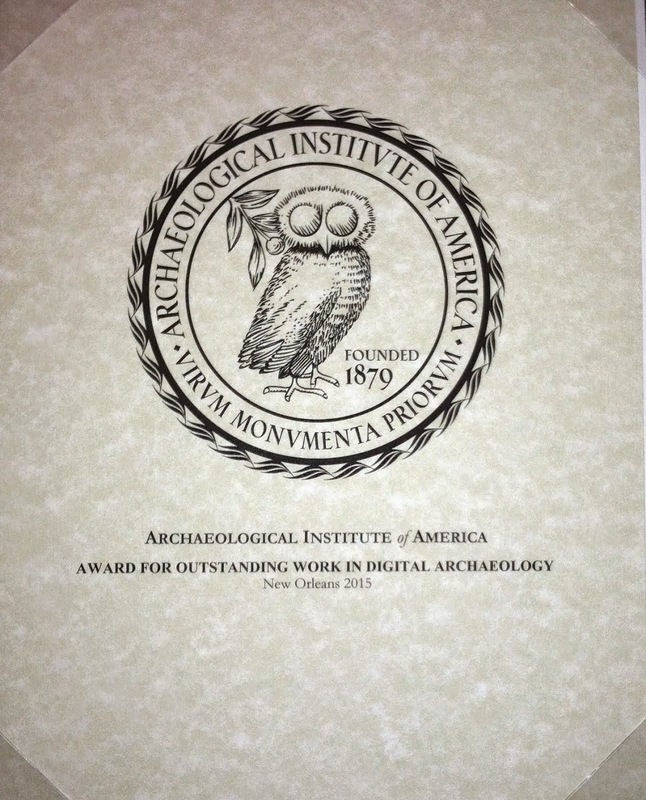 It is a desideratum to make digital images of at least the published papyri accessible on the internet. None of the Hawara papyri (except for single columns of the Hawara Homer, Hawara epigrams, and the Periegesis of Attica), have ever been shown in photographs. Hatzor - "The Head of all those Kingdoms"